We are proud to announce the UO Cataclysm Project, an Ultima Online Free to Play Shard powered by RunUO. Based on the widely missed, delightfully nostalgic, and down-and-dirty fun to play UO era that is the Sphere 51a Playstyle, Cataclysm at its core replicates the necessary game-play mechanics for this play-style and presents itself in a way familiar to those who are fans of the genre. Our world is full of creative, custom armors and unique and dangerous dungeons to explore. Much game play was taken from Sphere such as PVP, PVM, Felucca Only, No Pre-Casting. Sphere at the time was also incomplete, so we've added the finishing touches that we felt it would have had back then, should it have been as mature as RunUO is today. Cataclysm UO was widely inspired by many Sphere 51a servers from the 2001 – 2004 era, such as Imagine Nation. 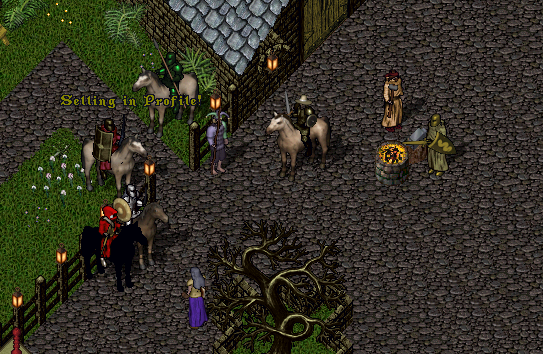 Many of the core game-play features of this genre are from The Second Age era of Ultima Online. Your familiar Ultima world has been transformed into a detailed colorful land full of friend and foe. No Skill Cap; 300 Stat Cap, with a max of 120 each Stat. Game Mechanics based on Sphere 51a and The Second Age. No Trammel or other facets. This is a Felucca only PvP Shard. Sphere 51a Style PvP/PvM Combat. No skill cap promotes fast paced sword wielding and casting skills, at the same time. Young Player System and Newbie Training areas to help you get started. 26 unique Ores to mine. Newbie Dungeon No PvP Zone to help new players get started. Repetition Based Skill and Stat Gains. Fast gains on combat related skills. All of the original dungeons, re-vamped Cataclysm Style. New dungeons to explore unique to our world. An armory of custom weapons to forge and magic weapons to wield. Second Age era correct crafting menus, guild menu, help menu, and resurrection gump. All the necessary old features of Sphere, such as resurrection on a corpse auto re-equips items. Housing system the old-school way, with key-to-lock-down like Sphere. Secure chests. Skill Scrolls drop often on monsters to help you train a combat ready character quickly. Hunter's Hall Quest System including daily quests with great rewards. Currency Rewards and rares to purchase for Gold and Platinum. Automated Skill Rewards, earn rewards for Grand-Mastering certain skills, just like the old days, with an automated system. In-Town housing available in many popular areas. Many hidden exotic and rare mounts such as Mustangs, Orns, Zostriches, and Nightmares to tame. An army of new and unique monsters to fight. Rare and special house decoration item drops on monster loot. Dungeon and World Bosses to kill with epic loot. Casino area with Slot Machines, Black Jack, and other games. A new twist on your familiar Britannia, with a highly decorated and customized world. Automated Daily, and Weekly scheduled special events for all play styles. Privately developed for over 7 years on the RunUO engine for a bug free retro feeling server. Our custom client offers a unique updated old school experience.